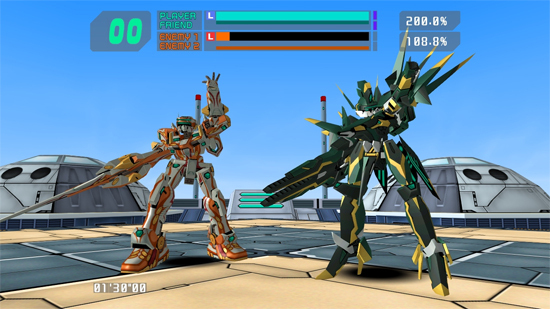 Every game and their mother seems to be getting a special edition these days and while many of them aren’t worth their weight in bananas the Virtual On Force one certainly is. With a release date of December 22nd on the Xbox 360 in Japan, the special edition comes with six CD’s containing the soundtracks from the previous fours games in the series, an art book, and cover art designed by the same guy who did the art for Oratoria Tangram on Dreamcast, Hajime Katoki. While the regular edition will cost about $66 the special edition clocks in at about $112. Combine that with the cost of the Hori Twin Sticks ($330) and you have an expensive hobby, my friend. That sounds cool! The cost is reasonable, considering all you get, but I still doubt I’ll be shelling out the bones for it. Also, Cypher looks badass in that picture! Announce this for the US already Sega!! !